From opera to vaudeville… silent films to “talkies”….full-color 35mm to digital….if only the walls of the Keystone Theatre could talk. Over its 125-year history, the Theatre has seen many changes in technology along with many changes in owners. Walter and Beverly Buffington owned the historical theatre from 1969 until 1988 – some of the toughest years the theatre and its owners would experience. Despite the 1972 Agnes Flood, a U.S. fuel crisis, struggles to make payroll and the “biggest re-structuring of the entertainment industry in 200 years,” the Buffington’s held on and kept the Theatre open and showing films. In 1988, the Bradford County Regional Arts Council (BCRAC) was a small, all-volunteer organization. Started in 1976 by Pat Zalinski, the Arts Council’s main focus had been mainly on a summer arts camp for kids. When the word hit the street that the future of the historic Keystone Theatre may be in jeopardy, the rally cry went out and a group of supporters from throughout Bradford County started a campaign to keep the old theatre open and serving the community. In October1988, the BCRAC officially took ownership of the Keystone Theatre and with the help of hundreds of donors and volunteers, began an $800,000 restoration project, which brought new life to the Keystone Theatre. First-run movies were offered seven days a week and live performances were offered on the historic stage throughout the year. “Brooks’ interest from the start was preserving the building and keeping it open. We went out and looked at the historic theatre in Warren, PA that had just been renovated and I think that’s when the seed became firmly planted… The Clemens Center renovation about ten years earlier in Elmira, NY was also an inspiration to all of us,” recalls Ruth. In 2001, with major support from the Towanda Borough, Representative Tina Pickett, and the Commonwealth of Pennsylvania an addition to the Keystone was constructed which included a 105-seat stadium theatre, rehearsal hall and boardroom. The exterior of the addition was modeled after a storefront that had originally been beside the theatre in the late 1800’s and early 1900’s. Once the addition was complete, it became easier to hold first-run movies in the new complex, regional live shows could more easily rehearse, and community groups now had meeting and rehearsal space. In September 2011, two major renovations began at the Keystone Theatre – one planned, one unplanned. The planned Keystone Theatre Accessibility Project started September 1 and was completed in early Novmeber 2011. The Project addressed several issues, including the slope of the floor in the historic house, aisle lighting, wheelchair accessibility and safety, noise reduction, and equipment movement for live performances. The aisles entering the main house of the Theatre were grandfathered at a beginning slope that was 1.5 times current code allowances. The steepness of the slope has caused safety issues for patrons entering the theatre in addition to wheelchair patrons attending events. Floor plan changes in the main house created more seating space for wheelchair patrons and their guests. The existing space in the back of the theatre, created in 1999, was often taken up by lighting and sound crews during live performances. In addition, wheelchair accessible thresholds were installed on the front doors of the historic section of the Keystone Theatre. Renovations also included auditorium doors between the main house and the lobby to reduce street and lobby noise in the auditorium during movies and live performances. Previously heavy curtains were the only barrier between the auditorium and the lobby, which were not effective in keeping out distracting noises and light. And finally, renovations utilized the old orchestra pit area in the front of the main house auditorium for a scissor-lift system that will make it easier to move the grand piano from the floor to the stage and to move in equipment for live performances. When not in use, the lift will be hidden in the floor in front of the stage. The historic auditorium re-opened on Sunday, November 20th with a performance by Molly Mason and Jay Ungar. The unplanned renovations started following the 2011 Flood caused by Tropical Storm Lee, when the lower levels of the theatre were flooded causing $170,000 in damage. “The lower level of the Keystone, which includes the Rehearsal Hall, Board Room, a small office, and the dressing rooms, had approximately 4-5 feet of water,” says Brooks Eldredge-Martin, then-Executive Director of BCRAC. The rooms in that level needed to be gutted, rewired and refurbished. For the first time in the BCRAC’s ownership, the Keystone Theatre shut down for more than a week while not only work on the theatre began, but also while families and communities struggled to deal with the devastation caused by the flood. After a year of clean-up, tear-down, rebuilding and many, many volunteer hours and donations, the lower levels of the Keystone Theatre are almost completely back to normal. Small finishing touches are all that remain and it is virtually impossible to tell that just a year ago that level was underwater. However, just as the Keystone Theatre recuperated from the Flood damage, a new threat emerged – digital conversion at a cost of $70,000-$80,000 per screen. Cinemas and theaters across the country were now racing to keep up with movie companies and 21st century technologies by converting soon-to-be-outdated film projectors to digital ones. As movie companies began to produce their movies in digital format only, cinemas and theaters had only two choices – convert or close. Since the 1920’s, movies had been shown on film. Movies shown at the Keystone Theatre, as with other theatres nationwide, arrived in large canisters shipped by distribution companies via air, truck and courier. Once a film arrived at the theatre, staff had to splice the multiple reels of film onto a platter, thread it into a projector, and then break it down for return shipment. Once again the BCRAC Board stepped forward, committed to fundraising for all three of their theatres (Keystone, Rialto and Sayre) and ensuring the future of Bradford County’s only remaining historic theatres. 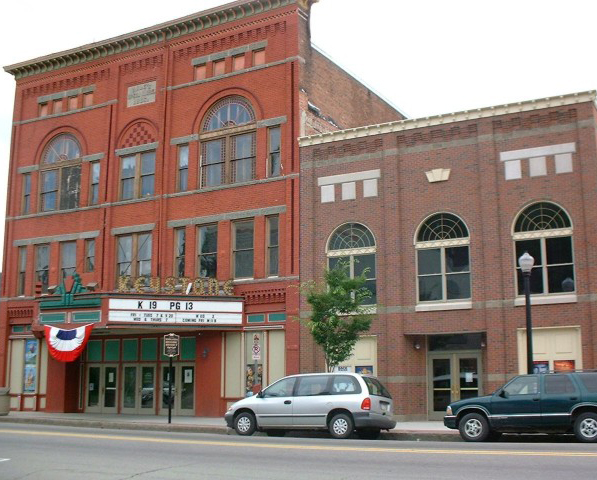 On September 30, 2012, just one week after celebrating it’s 125th Anniversary, the Keystone Theatre showed its last 35mm film ever and shut its doors for four days, Oct0ber 1-4, for conversion to digital projection and the addition of 3D capabilities. The conversion, completed by Integrity Entertainment Systems of Schenectady, NY, required the removal of the old film projectors and “platters” and the installation of new Christie digital projectors. One of the old projectors, a 1950’s Simplex Peerless E-7 projector, had been working nightly at the Keystone Theatre for well over 50 years. Each of the old projectors with their lamphouses and support stands each weighed an estimated 300 pounds. The new projectors weighed in at just 96 lbs. The new digital technology allows for the movies to arrive by satellite download or as a paperback book-sized hard drive. The Theatre re-opened on Friday, October 5th to new, crisp digital projection in the historic auditorium and digital plus 3D capabilities in the newer, stadium-style auditorium. 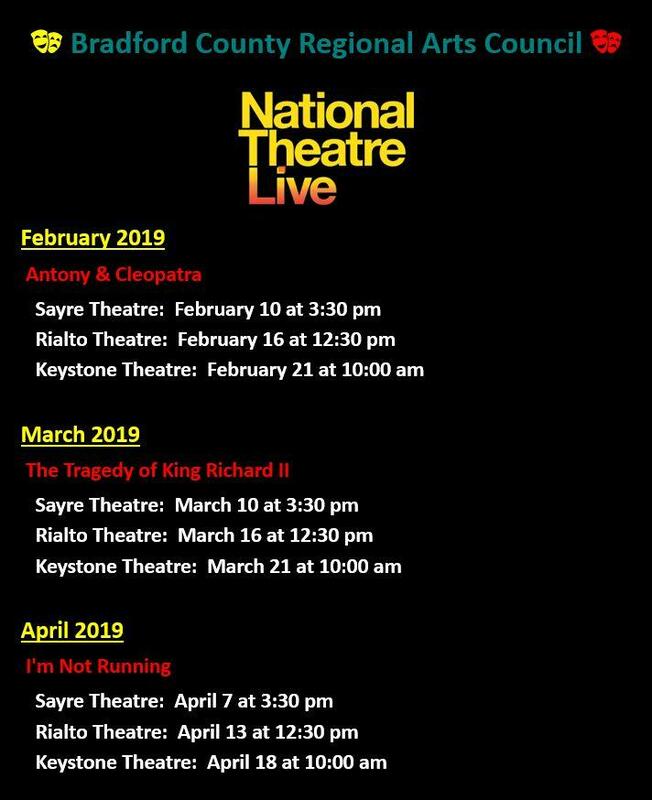 Today, the Keystone Theatre remains northeast Pennsylvania’s oldest operating theatre, and with the help of the Pennsylvania Council on the Arts, regional sponsors and the United Way, is the home of live performances ranging from a Schooltime Youth Series to a Nightlife on the Susquehanna Series to special summer concerts presented year round. In addition to the movies and live shows, the lower level of the new addition of the Keystone is bustling with dance school rehearsals, dance and yoga classes, community meetings and special events. The Rialto Theatre is one of three historic theatres owned and operated by the BCRAC. The BCRAC, established in 1976, is a regional non-profit organization committed to supporting arts and culture throughout the region. For more information, visit BCRAC online at www.bcrac.org or www.facebook.com/BCRAC. As BCRAC struggles to recover from flood damage, digital conversion and other unplanned expenses, upkeep on the three historic BCRAC theatres continues to increase while movie profits continue to drop. The result: BCRAC is faced with a stressed financial position that threatens the life of not only the organization, but all three Bradford County theatres. Donations by businesses and community members are vital to keeping the three theatres open and arts programming alive for Bradford County residents. • Be a BCRAC Patron! Each time you buy a movie ticket or gift bag or purchase a live performance ticket, you help support the BCRAC, local arts programming and the three historic theatres.